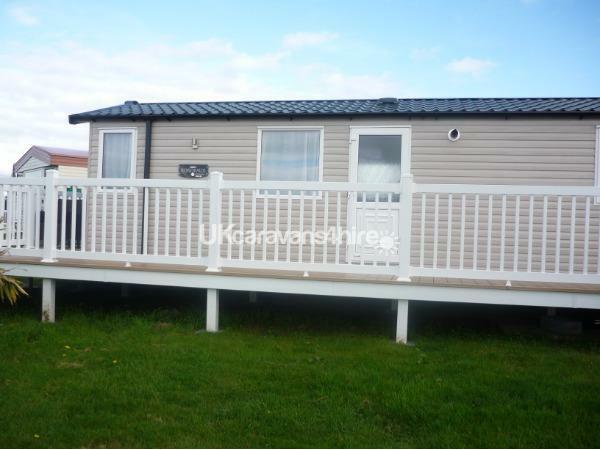 A HOLIDAY HOME you wont be disappointed in. 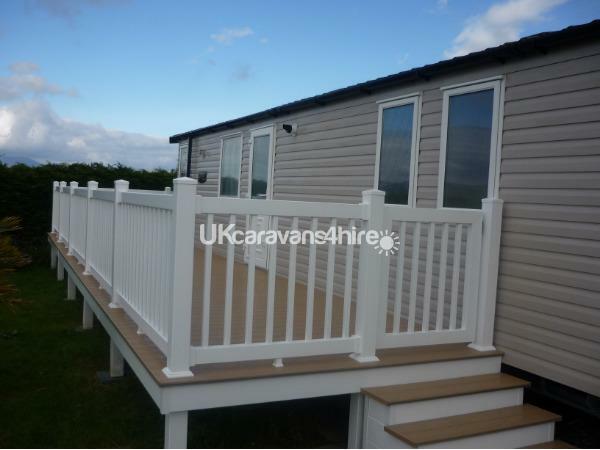 With Stunning views.French doors and Decking. The Swift Bordeaux Exclusive Platinum is a prestige holiday home, 3 bedroom sleeps up to 8 people, spacious 40ft extra wide, fully double glazed with gas central heating The lounge area is a great size airy and spacious, with freestanding furniture, coffee table stow away stools pull out sofa bed and large flat screen TV. 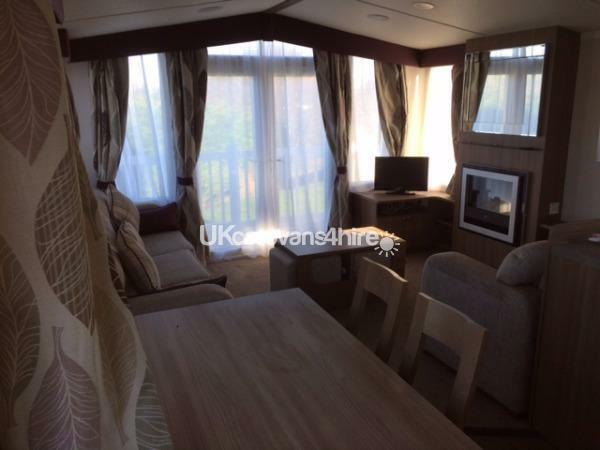 French patio doors open from the lounge to the front of the caravan on to the veranda where you can sit and relax on the patio furniture take in the spectacular views and chill out with a bottle of wine. The dinning area has free standing table and chairs opposite the open plan kitchen which comes fully equipped with everything you may need during your stay including full sized gas oven, grill, microwave, kettle, toaster full integrated fridge & freezer and all the crockery, glasses and utensils you need to cater for family meal times. Lots of cupboard space for storage. 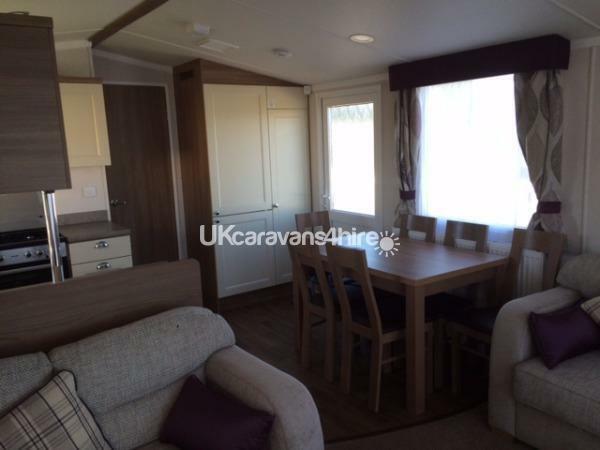 The Caravan has three bedrooms and can sleep up to 8 people using the pull out sofa bed located in the lounge. Shower room featuring large shower cubicle. Mirrored bathroom cabinet, shaver socket, LED vanity lighting and acrylic splash back. There’s a toilet in both the bathroom and double bedroom, so the rest of the family don’t have to wait if they need the loo while if one of you is using the bathroom. 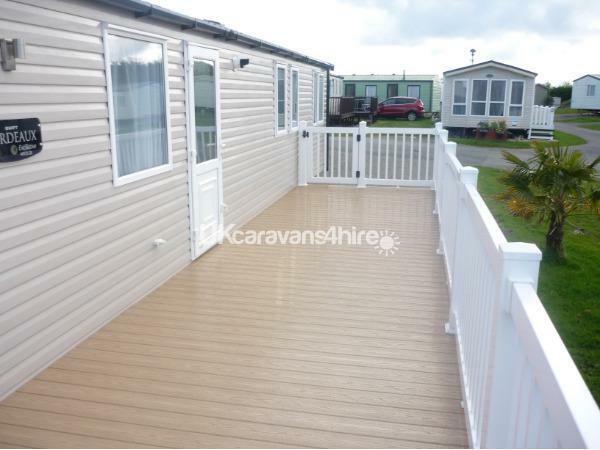 It’s relaxing, has all the facilities you need and more, and offers enough space for a big family to make it their home from home and enjoy your holiday. 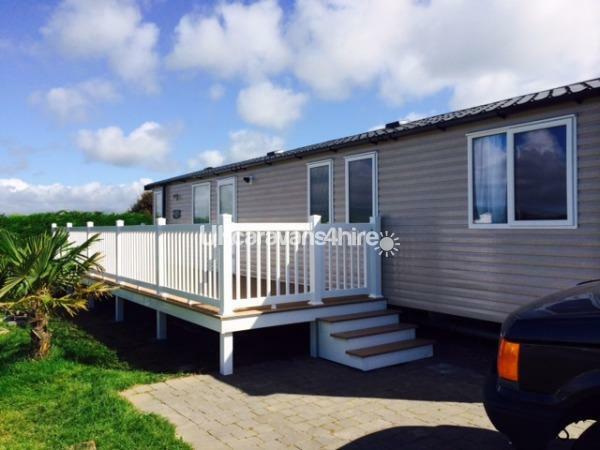 Outside the Caravan there is a spacious car parking space and green turf area, fully decking,the unit is situated close to the beach (5 minute walk) and in quiet and peaceful area of this vibrant holiday park. The caravan is located on mountain view with a short stroll to all the main entertainment ie splash zone, Board-walk, Cove and the main shops restaurant, beaches and the dragons adventure village. Price do not include Passes, these can be purchased (if required) on day of arrival at Reception. Check in from 3pm on day of arrival. A £100 deposit (Non Refundable) is required to secure a booking. Ask about are special rates for Senior Citizens. Additional Info: Pub/Club, Fishing, Amusement Arcade. Swimming pool Splashaway Bay,featuring Flip and Flop etc. Launderette, Crazy Golf, Grocery Shop, Takeaway, Restaurant, Kids Club,Crazy 9 Hole Golf Restaurant,Starbucks,Burger King,FishΧps shop,Pappa Johns,Bikes&Karts,2 Beaches,3 Shops,Rope works,Boating Lake,Football cages,Playground etc, Park Ranger events. NOW OPEN the sites new developments include.Dragon Lakes Activity Village, The coast House Bar and Grill, Coastal Clubhouse Sports Pub HMS Glendower. Boat rides,sand pits multi sports area, climbing walls,rope courses, bunge,trampoline Mini 4x4 safari driving experience. Cakery,Pizza Deck. 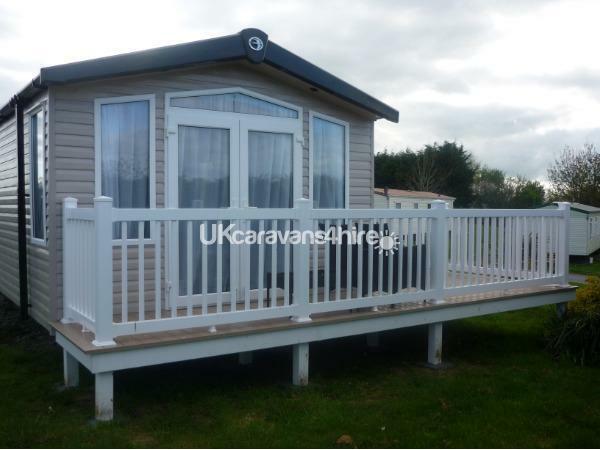 We had an amazing 2 weeks staying at this caravan. It was almost like new. 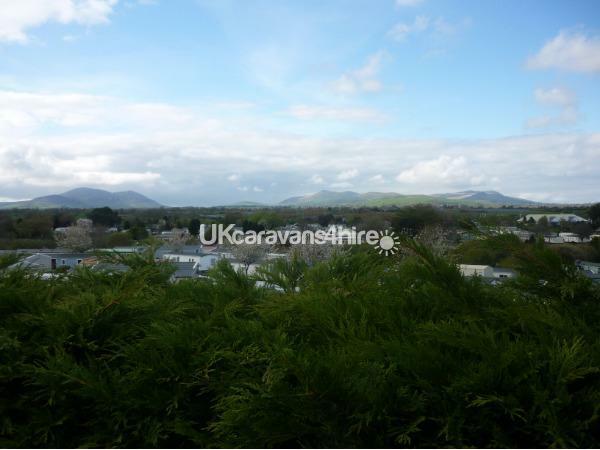 It's position on the site is perfect - not far from the beach or the site facilities and the views are amazing. 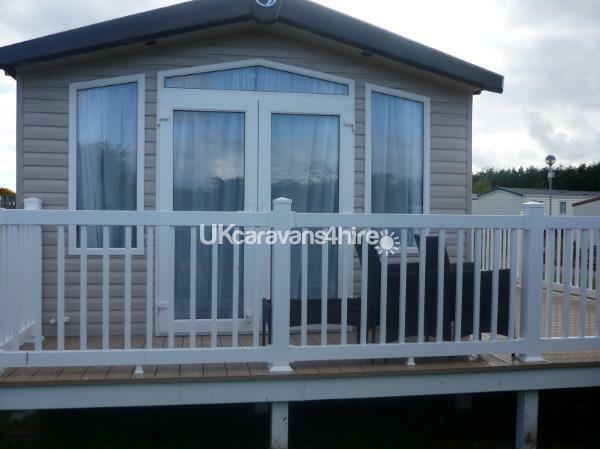 Having a veranda and an en suite were priceless! 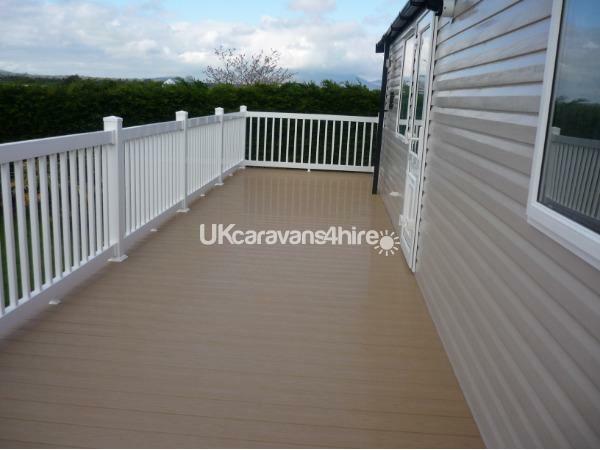 The veranda is a perfect size for the children to play on safely. 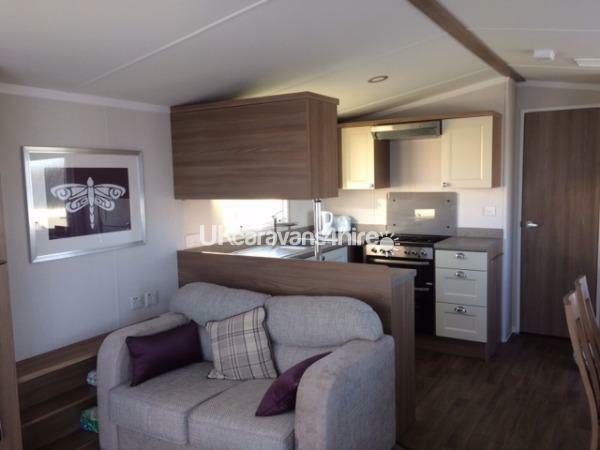 The beds are very comfortable, there is plenty of kitchen essentials and the full size fridge-freezer is a big help. There are even some toys, books and DVDs there. The booking process and our stay were faultless. There are lots of activities on-site including lots of things to get the kids interacting with nature and it's not far to lovely streams for paddling and playing on the rocks.